In my opinion, Thomas Gillmer designed perhaps one of the top 10 all-time classic sailboats in his 23′ Blue Moon. While noted for other beauties like his topsail clipper schooner, “Pride of Baltimore I and II”, this little 1943 gaffed yawl is a real looker. One owner, John, has a blog featuring the sailing and projects for his yawl. Another owner, Mark, has a beautiful example named “Time”. Some photos are here from a previous listing. Before my classic Luna, I was mightily tempted by the lovely Time. 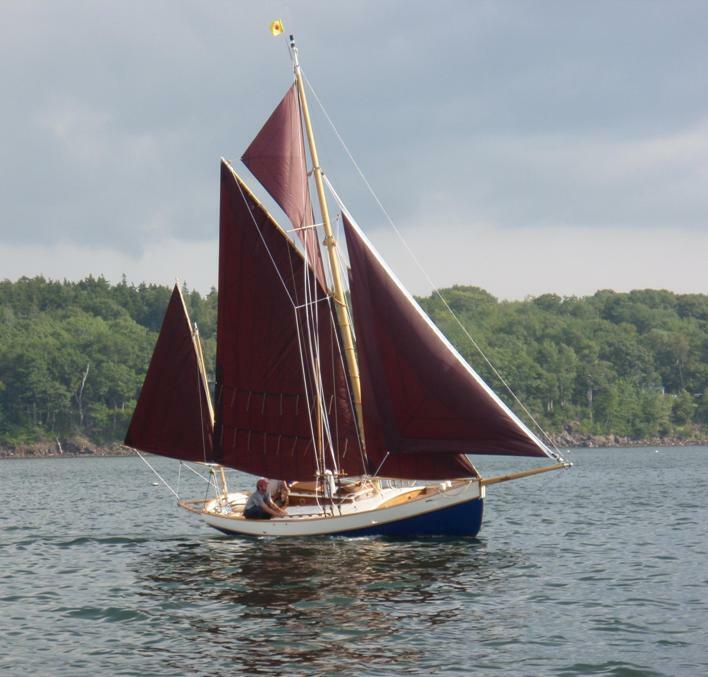 I found she was again for sale in WoodenBoat for sale. After an earlier visit to Oxford before launching, I called Mark and arranged to help rig her in exchange for a sail. The day was sunny, but winds were less than 5 mph and I confess I was skeptical Time would move along, but move she did. With hardly a breath she pushed under full sail effortlessly and her 8,000 pounds gave momentum to her way. Thought I’d share 2 videos of our sail. I believe she is still available to the right owner. Too bad we can’t have them all. Time is an original. I guessing that I’m older than you, but felt I must get in touch! I am the daughter of a sailor and it has shaped my life in ways I could never have imagined. Surely Dad had no idea what a wonderful gift he gave me. I bought back the Gillmer Blue Moon my father had dreamed of for years before having John Swain on Chesapeake Bay build her in 1989. I bought her because I’m the daughter of a sailor! I loved the Off Center Harbor video. My tender is an Eastport Pram, … it reminded me of the first boat I ever rowed, a pram Dad built when I was 4. Some of my earliest memories are sailing a Cotuit skiff with Dad and watching him work on the Blue Moon model “Marty of Cotuit” (Marty, my mom), he built long before he could afford the boat itself. I have the model as well. Dad’s Blue Moon made her way from Lake Ontario in upstate NY to SALTS in Victoria, BC as a gift when he could no longer sail her. He didn’t tell us his plans, and we were sad she’d gone out of the family. SALTS ultimately sold her to a fellow who cared for her well for a decade. Then by chance I discovered she was for sale. Soon she was mine, and she and I both now live in Port Townsend … two gracefully aging ladies. (I moved from NY!) Dad’s still with me every day, but especially when my hand’s on the tiller of “Katie & Ginny”, so named for his daughters, by the father who first loved her. That is a wonderful story. It gives me hope that in some ways I am passing on some things of import to my children. I do know my daughter has received the joy of sailing. I would love to see any pics of your pretty vessel and the model too. The “time” I spent with Mark Scott on his Blue Moon was special. I’ve been meaning to find out who now owns her. I believe she is on the Upper Chesapeake. The design is unlike any other I’ve sailed and is exquisite in line. Lovely little ship. I’m looking forward to enjoying LUNA much more this year.